Advent began yesterday, and for a lot of Christians that means a season of waiting and expectation. I'm planning to begin a new series on the blog, focused on different ways to spend time gazing on Jesus in prayer. You know me, I'm always trying to connect my own interests, whether spiritual or otherwise, to my kiddos. 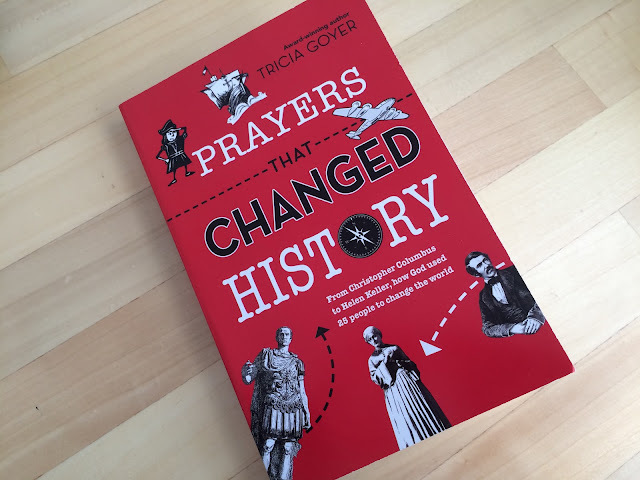 I snagged a review copy of the newly released devotional "Prayers that Changed History" by Tricia Goyer. The book covers 25 men and women who made a direct or indirect impact on Christianity and the world at large, with an emphasis on their answered prayers. Before you might think this is a how-to manual with exemplary prayers that are effective at getting God to do something--the title kind of makes it sound like that--I want to clarify that Goyer writes about pray from a few different angles. She sees prayer as both petitioning and as spending time with God, open to His transformation. As Goyer says, "prayer changes things, starting with us," which indicates that the second view of prayer is the primary frame for most of the stories in this book. This 223-page paperback is organized chronologically, with chapters on Polycarp, Constantine, St. Patrick, Oswald (King of Northumbria), Christopher Columbus, Martin Luther, Governor William Bradford, John Eliot, Susanna Wesley, John Newton, Robert Raikes, Mary Jones, Sojourner Truth, Catherine Booth, David Livingstone, Florence Nightingale, George Muller, Billy Sunday, Helen Keller, Amy Carmichael, John Hyde, Mother Teresa, The British People of WWII, Corrie ten Boom and Dietrich Bonhoeffer. Each chapter begins with an image of the featured character, a narrative describing the character's endeavors, a "Something to Think About" prompt, an "in His/Her Own Words" segment featuring writings or quotes from historical documents, a "How He/She Changed History" section describing the world-changing impact, an "it's in the Bible" portion showing a parallel story or concept in scripture, and a "Your Life" summary that prompts young readers to apply principles from the story to their own experience. Some of the early stories, such as Constantine, Christopher Columbus and Oswald, King of North Umbria and even Martin Luther fell a little flat for me, perhaps because I felt that her Christian lens minimized some of the more questionable aspects or actions of these men. But overall, most of the stories were both interesting and inspiring. For example, I heard a lot about Helen Keller in school, but I don't remember anything about her early love for God or her prayerfulness. I also liked the author's development of the Thanksgiving story with her narrative of God's miraculous answer to Governor William Bradford's fasting and prayer for rain. Additionally, Goyer's commentary in the devotional sections of most stories had a gentle, thoughtful tone. For instance, Goyer prompts readers to think about Sunday School innovator Robert Raikes' story by asking " What are the things you are most concerned about? What small thing is God asking you to do? What is one way you can pray for God to do a small thing through you?" Goyer also wins some points for using scripture from several different translations, such as NLT, MSG, ESV, NIV and KJV. I can see homeschoolers enjoying this book as a way to get a sampling of history as well as learning how small prayers (plus actions) can have great impact.